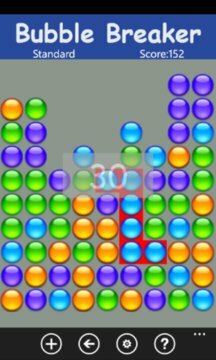 Bubble Breaker game is a popular game, there are four modes in this game. In the Standard mode, the bubbles drop as the ones beneath them are removed--a one-dimensional mode, if you will. As you complete a column, the remaining ones to the left shift. The Continuous mode adds a twist, allowing you to play for as long as you can keep the game going. As you complete a column, the remaining ones shift and a new column is added. A preview of the row to be added, like in Tetris, appears at the bottom of the screen (the top of the column is on the right.) 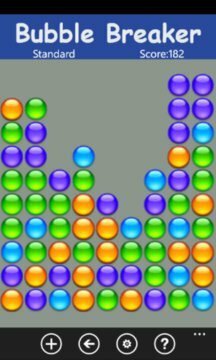 A third mode, called Shifter, operates like the Standard mode, except that the top of the stack shifts immediately after the bubbles next to it drop. Last and most challenging is the MegaShift mode, which is pretty much "all of the above" You really have to play it to experience it. Four diffent color numbers (four, five and six) can be selected also. Features: 1> Four different Modes. 2> Three different color number:4,5,6. 3> Three different board size:11x12,10x11,9x10. 4> Bonus for removing all balls from the board. 5> Tracks high score and average score. 8> Listen to your own music.